This is week two of our series called; “What do you want?” It is the question Jesus asks Bartimeaus who is blind and seeking Jesus’ assistance. It is also a question Jesus asks all of us. What do we want? Before we begin this week take some time and reflect on what it is you want. Maybe you started this last week, if so this week you might keep focused on what you heard reflecting. God, the creator of the universe stands ready to answer your response. So what do you want? Our first week we looked at this question, what do we want? We determined we were not made to be alone, in fact we decided we need to be together, we need one another, we need each other. We all come from the same origin, we are of the same flesh, we are united as one in marriage, we are consecrated by Jesus as one vast community, we are saved as one with our Savior, and we are many moving toward the glory Jesus provides. Although we are unique individuals, we are one, originally one, saved as one, and end up together. We cannot be alone. What we want is others in our life. 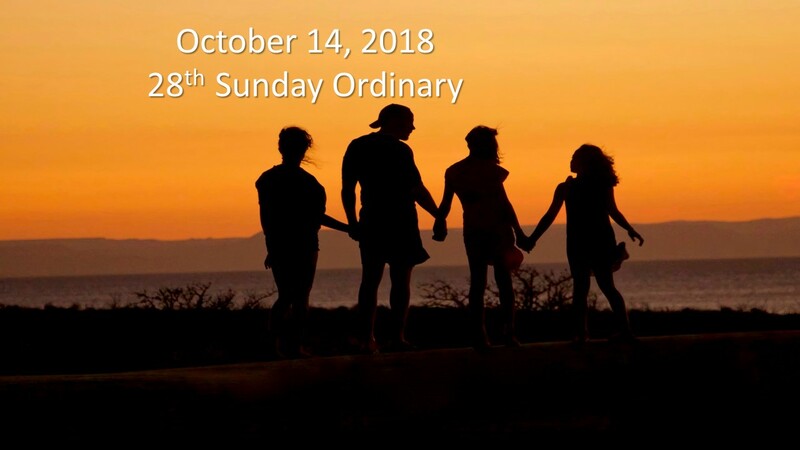 The readings this week are from the Lectionary for the Twenty-Eight Sunday in Ordinary time; We begin with; Wisdom 7:7-11; Psalms 90:12-13, 14-15, 16-17; Hebrews 4:12-13 and Mark 10:17-30. As we look at the question to each of us, what are you looking for, the readings show that God knows what we need and is already answering the question. Last week, we learned God does not want us to be alone, in fact God wants a kingdom where we are all one. This week we learn God really knows we want to have a good life, the best life we can have, a life of happiness. The reading from Wisdom shares the message that nothing can compare with wisdom. Here we read neither a throne, priceless gems, silver, nothing, can compare to Wisdom’s splendor and beauty. It is a message that infers superiority of spiritual things over material things. Solomon the wisest man in the era before Jesus is known for answering God’s question of what he wanted, telling God he wanted wisdom. God gave him wisdom and then on top of wisdom he also gave Solomon countless riches and all good things. Having wisdom means first letting ourselves be guided by God, understanding the world and people as much as possible, and it allows us to connect reason and faith to be able to reconcile between the spiritual and the material. It is with wisdom that we are able to live our best life, not relying on our own works to achieve but rather depending on God to live our best. The reading from Hebrews refers to the word of God as living and effective. It is a word that can judge us, seeing deep into who we are and reflect the thoughts of our thoughts, our thinking known. Nothing can be hidden from the word of God and ultimately we must render an account for ourselves. But long before that judgement we are judging ourselves and our actions constantly. We wonder are doing what is best, what is right. In John’s gospel Jesus is referred to as the Word of God. This reading suggests we can depend on the word of God to offer us clarity as we live. If we depend on the word to make decisions in our life, to guide our heart, we are trusting the word to lead us to our best life. Therefore knowing the word and using it as a guide will help is the path to our best life. The reading from Mark tells the story of a rich man who asks Jesus what he has to do to inherit eternal life. Jesus tells him he must follow all the commandments and he must sell all he owns giving the money to the poor. The man leaves sad because he had many things. Jesus continues speaking to his disciples saying it is hard for those with wealth to enter God’s kingdom. The disciples wonder than who can be saved. Jesus replies for humans it is impossible, but for God nothing is impossible. Jesus goes on to say there is no one who has given up everything for his sake who will not receive one hundred times more of what they have given up. Jesus promises this one hundred fold return in our current life. And if that is not enough, Jesus also promises eternal life. It is an amazing message, give up all you have and not only will you get it all back one hundred fold you will be guaranteed a mansion in God’s eternal kingdom. We don’t know if the rich young man sold everything and followed, but the sadness he feels leaving seems to indicate he did not understand. In this reading we are being asked to divest of all we own to make room for God leading us to our best life. Many of us do not comprehend this message, if we did more of us would be giving everything away. Undoubtedly trusting this message, divesting and being open to God is the way to have the best life now and eternally. In the context of our theme; what do we want? the readings this week give us a second answer to this question from God. Even before we can say what we want, God is showing us what we need. We want to live our best life. We want to live stress free and in peace, we want to be secure and safe. We want to be able to enjoy life and at the same time have a feeling of accomplishment. In fact these are more than things we want, these are things we need. We all want to live a good life, the best life possible and the readings guide us to an answer that is saying be wise, trust the living word, divest of what we own and be dependent on God then we will live a good life. What do we want? We want to live a good life, in fact we want to live the best life possible which can only come from trusting God. A single young man who feels he is quite successful goes to a club hoping to meet some people and maybe meet that special someone. The club has dancing, music, drinks and food. Everyone seems to be having a good time. He reflects how good he has it, his career is successful, he makes loads of money, drives an awesome car, has a great house, designer clothes fill his closet, he has someone who cleans and cooks for him, he has many big boy toys including a boat, a helicopter, a swimming pool with hot tub and so much more. He truly is a man who wants for nothing, that is no thing. In the club he sees an attractive young lady and approaches her, they seem to hit it off, dance a little, share a drink and then slip off and talk. He tells her all about his success and how he doesn’t want for nothing and how happy he is in life. In fact from her perspective he almost seems to be bragging about all he has and how well he has done in life. They continue to talk and seemingly enjoy each other’s company. After a while she thanks him, remarks she needs to get home and leaves. As she walks away, he feels a certain loss, a certain unhappiness. He really doesn’t understand what just happened and why he feels empty. He has every thing he could ever want and yet he felt sad. Of course the moral of the story; people make us happy not things. Sure things bring joy when we have someone to share them with but with no one in our life the things cannot substitute for true happiness. A we discussed last week, we need others, much of what makes life good is sharing it with someone. @Andy_Stanley in a message series on happiness says, “Happiness is about a who not a what.” This is true. In fact if we think about the regrets we have in our life they are always about a relational breakdown, not a broken thing. This week’s message is about what makes the best life, the readings lead us to move away from things and make room for others, the first other is God. Having wisdom is having God in our life. Depending on the word is depending on God in our life. Divesting of our things makes room for others and God in our life. The best life we can have is a life with God at the center. If we want to have the best life we must follow Jesus instruction in the gospel, sell everything and give to the poor. We should also work on traits that lead to the best life. What are attributes we should all aspire to have that will lead us to a good life? Here are five traits of a good life; Principle, Purpose, Prolific, People and Peace. If you work on these attributes you will be on the road to a good life. There are certainly other attributes to a good life and maybe this isn’t the right mix for you. However, if you place priority on these five traits, you will live a better life, a God inspired life through wisdom, the living word and divesting of what you own to make room for others. To be a person of PRINCIPLE we are people of conscience. We have a moral code that guides us to know right from wrong and how to avoid doing wrong. We are proud of the what we do, our acts are intended for good. Being always good makes a life that removes any concerns for secrets. Being good makes us most like God, who is all good. We can be proud of all we do and it can be visible to all who we know. To be a person of PURPOSE we desire to accomplish. We aren’t living just to have pleasure we want to fulfill something. It not that we are looking to have a road or bridge named after us but we want a way to leave our mark in the world. We hope what we have do has an ultimate impact that is for the good, helps others and is something we can be glad to be part of accomplishing. Putting God at the center helps our purpose by orders of magnitude. We God we are bigger than we could ever be on our own. As Jesus says, anything is possible with God. Give your life a purpose and then lean into that purpose with all you can give. Purpose is an important trait to live our best life. To be a PROLIFIC person we want to be someone who gives life, someone who is generous. Giving life can happen in so many ways; we can give all we have to the poor as Jesus tells us, we can share our wisdom and knowledge as a teacher or mentor, we can birth or adopt children and have a more direct impact on the lives of others. A prolific person is someone who behaves like a gardener, planting seeds, nurturing the soil, water and harvesting when what is planted has grown. The prolific person is fruitful and spreads what is theirs to help grow others. This attribute of giving is very much like God; the greatest giver. A giver, someone prolific has a trait for living their best life. To be a PEOPLE person means we know we depend on others and others depend on us. We know we cannot live without others in our life. We know that our best life can only come when we others share our life. We cannot be an isolated individual and expect a good and happy life. As we discussed last week, we are people who need people. Having the right people in our life is most likely the number one trait of a good life, of a happy life. But we don’t just want people in our life we want long term friendships. People who have come into our life and stayed. Usually these are people who are giving and receiving from our friendship and can help us to be our most prolific. God is no different in this regard, God created people so that we all would be in God’s life, God lives in a triune relationship modelling relationship is important to a good life. Finally to be a person at PEACE is to know that everything in life is under control. We are not usually the ones in control, we depend on God for that, but trusting God will take care of us, leads to peace. We need to be at peace with others, with ourselves and with God. Peace is a relational attribute. As we mentioned, regrets happen when something is broken between us and others, so there can be no peace if we have a broken relationship or have done something to hurt another. In order to truly be at peace we must be sure all our relationships are whole, which includes who we feel about ourselves. A peaceful person is always a person living a good life, and is someone who is happy. These five traits of a good life can all be found in relationship with God. God defines our principles, gives us purpose, encourages a prolific life, puts people in our life and makes us people of peace. God at the center makes these traits easy to follow and accomplish. God has each of these traits and teaches us all of them. The readings today reinforce these traits. To have wisdom is to know we need to learn these five traits of a good life and follow them. To know the living word we learn about the five traits of a good life and find ways to deepen our growth in these traits. Finally to divest of all we own makes room for God helping us discover these five traits of a better life. God wants us to be happy, in fact the majority of Jesus’ gospel message is about a life of happiness. What do we want? The question that leads this series is an important question. We should take time reflecting on the question, thinking about what we would ask when face to face with God. God does want to know our answer. But God also knows what we need. From the beginning God knew we didn’t want to be alone and so God created companions. God also knows we want to live a good life, the best life, a happy life. So God gives us wisdom, a living word and encourages divesting of what we own to remove distractions. Follow a set of traits that give life principle, purpose, a spirit of being prolific, long lasting people in our life and peace. The best life has God at the center knowing God is our number one partner and yearns for our happiness. Next week we’ll continue to ask the question, what do you want and see how God is teaching us how to be most valuable.